I had to post this because we have this great new Indian restaurant right around the corner that our entire family (all three of us) can eat at for $20 Canadian. I am not kidding. 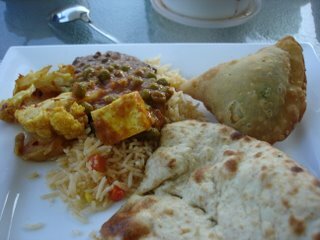 The cost of 3 samosas, chipati for 3, three dishes - lentils, ali gobi, and matir panir, plus rice is $20. Does that not seem incredibly cheap? It is hard to justify cooking at that price!